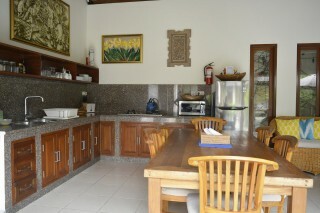 Located about 7.8 km away from Sacred Monkey Forest Sanctuary, this is an offering of two-bedroom villa which can accommodate up to six people. 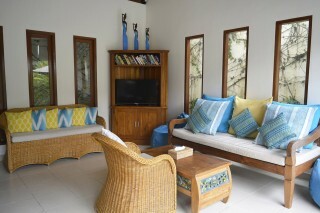 The property boasts a private pool, and the villa is ideal for a chill-out vacation. 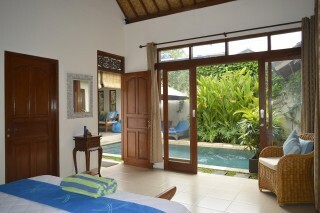 Your Space This gable-roofed villa boasts an appealing swimming pool so you can jump and take a relaxing dip. Loungers are placed on the deck for added convenience. 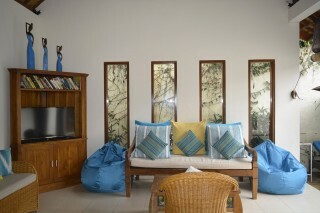 Inside, the living room houses a plush sofa set, bean bags, cane arm chairs, and a coffee table. 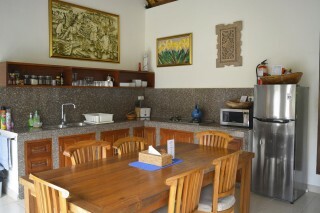 The dining area has comfortable seating for mealtime convenience. The kitchenette is equipped with a refrigerator, a microwave, a gas hob, and utensils so you can relish a tasty home-cooked meal! 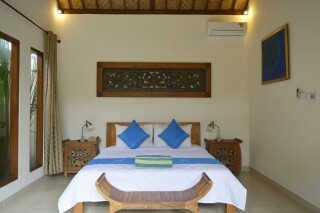 The bedrooms are air-conditioned and furnished with fluffy beds with side tables. The washrooms are tiled and well-appointed with western sanitary ware.